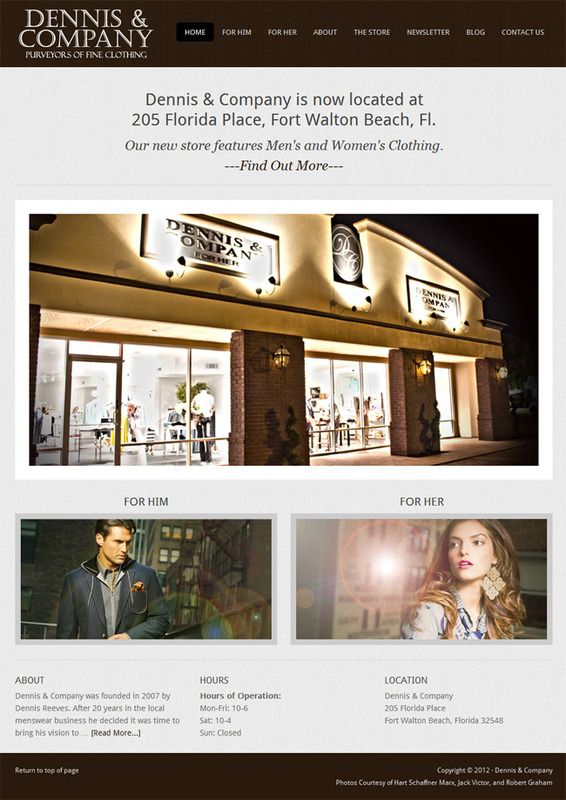 Dennis & Company Clothing wanted a timeless web design that would reflect the tradition of fine men’s clothing. Having worked in this industry for over 20 years, he has come to appreciate the traditions associated with being a clothier and wanted that to extend onto his website. Right away, we knew that we had to showcase some fashion pieces in a rotating gallery. It was also equally important to highlight some of the stores major services on the front page. Like a charcoal Grey suit, Dennis felt that simple was better. UPDATE: We have made some alterations on this site. Dennis & Company has expanded their store by adding Women’s clothing. The specialty retailer has also moved locations to accommodate their new division. The new look is based on the paint colors and interior design of the new store. As always, we want a seamless experience from the store to the site.